The New York City Jazz Record: In what ways do you feel you have evolved and grown as a musician since you started out? Vincent Herring: Wow, the list is too long to detail. I guess the most important thing is that intellectually I have learned more about music but, at the same time, I have also grown emotionally with music. I’ve connected with the history of the music and I’ve had a chance to work with some historical guys. The lessons of life and the lessons of music have helped me to grow and become the musician I am now. I’m continuing to evolve, but I’m aware of all the life lessons. TNYCJR: You’ve been recording for the Smoke Sessions label in recent years. What are you currently doing for them? VH: I just recorded another project and it’s going to be coming out in, I think, October or November. The project is slightly different from what we originally discussed. Originally, they just wanted me to go in and cut a record. But I added a vocalist, Nicolas Bearde. I added a horn section and [guitarist] Russell Malone joins us for a few tracks. The record really came out well. I’m really proud of it. TNYCJR: You seem to have a very positive relationship with Smoke Sessions, the in-house label of Smoke Jazz Club. VH: My relationship with Paul Stache, the owner of the label [and Smoke Jazz Club], is very good. The label is all about music. Paul really cares about music. He makes decisions based on music and that is rare. Paul has a good business sense, but he is also someone who really loves and cares about the music. TNYCJR: One of your current projects is The Story of Jazz, which has an historic outlook. 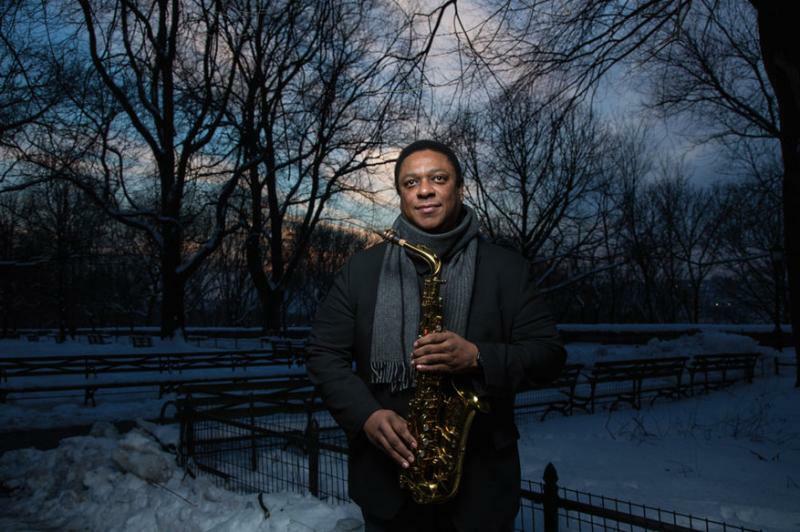 VH: The Story of Jazz is an allstar group of musicians, starting with Jon Faddis and Jeremy Pelt on trumpets, Eric Alexander and James Carter and myself on saxophones, Steve Turre on trombone and shells—and we have a vocalist named Nicolas Bearde. He’s a West Coast person. A lot of people don’t know him, but he’s very special. Mike LeDonne is on piano. Kenny Davis is playing bass and Carl Allen is on drums. We run through the history of jazz. The best way I can describe this is if you ever went to a Motown revue—or even Michael Jackson back in the day when he would run through all of his hits—this, similarly, runs through the history of jazz. The history of recorded jazz is pretty short; recorded jazz is 100 years old this year. We start with things from 1917—James Carter on the clarinet and Jon Faddis on the trumpet have such expertise in playing that music—and we end up to today. We really run through the whole history of jazz. It turned out to be quite a crowd-pleaser hearing somebody like Jeremy Pelt playing “One Finger Snap” and the next thing you know, he’s playing “Feels So Good”. Or hearing Jon Faddis playing “Things to Come” and the next thing you know, he’s doing “What a Wonderful World.” It runs through all the important times in this music and it’s just an amazing show. We’re going to be at Birdland in January. TNYCJR: What’s going on with Friendly Fire, your project with Eric Alexander? VH: Unfortunately, [High Note Records President] Joe Fields just died. Eric and I were both on that label at the same time; so, it was easier to get stuff done before. We would like to do another record, but now I’m on Smoke Sessions and Eric is still on HighNote. So how do we get it done? Whose record is it? What label does it come out on? TNYCJR: So, it’s up in the air whether Friendly Fire will do a new album for HighNote? VH: It’s up in the air whether or not we can get it done. TNYCJR: Eric is extremely expressive. He has major chops, but he doesn’t approach jazz in an overly technical way. He’s soulful and warm. VH: That’s correct. That’s the thing that separates Eric from everybody else. Eric does have the technical side and he is an incredibly knowledgeable musician. But the thing that separates Eric from so many people today is that he is genuinely soulful. TNYCJR: Eric learned from the best, much like yourself. Pianist Harold Mabern was his mentor. Along the way, you played with quite a few major jazz icons who are no longer with us, from Cedar Walton to Freddie Hubbard, Art Blakey, Nat Adderley, Dizzy Gillespie and Horace Silver. What are some of the most important things you learned from playing with musicians of that caliber? Cedar, for example? VH: With Cedar, I watched and examined how he put﻿ everything together—not just his music, but his relationship with the band. His relationship with the people who dealt with the business. You would never know that Cedar booked so much of his own stuff. We had a pattern: we would do Dizzy’s Club for two weeks in the summer. We would do the Vanguard for two weeks at the end of the year, before New Year’s. And we’d do Birdland in April. That was five weeks in New York City with Cedar. Then, he had a whole pattern around the country and around the world he would always follow. VH: I’m sure there were musical lessons I learned when I was with Nat Adderley, but one of the most important things I learned was that Nat was just a great person. Nat was just a really kind man and had a really kind spirit. I matured quite a bit when I played with Nat and I started to appreciate people in a different kind of way. With some other bands, like Horace Silver’s, I was really not ready for that job when I got it. But I couldn’t turn it down, being a young musician who had a chance to play with Horace. Between needing the money and wanting to play with Horace, I took it. I enjoyed the experience, but I wasn’t ready for it. When we were finished, I was immediately working hard to try to improve my musicianship and it gave me the direction and the motivation for developing myself. That was in 1986 or 1987. VH: When I worked with Art, I had just really started to get it together, playing decent. And that was one of my target jobs that I wanted. But at the same time, I had met Nat and started playing with him and Nat was just a great person. We were the best of friends. I called Nat up to tell him I had just finished two weeks with Art at Sweet Basil and we were going to Europe on such and such a date. Before that—months before that—I was always pressuring Nat, “Hey, man, we have to do some gigs. Why don’t we work a bit? Why don’t you want to tour?” All this stuff. When I told Nat that Art and I were going on a tour on such and such a date, he was like, “No, you’re not.” I was like, “Yes, we are. Art just told me.” And Nat was like, “No, we’re going on a tour.” So, I had to make a decision between those two bands right then and there. And it’s funny: I occasionally sign stuff that I have from an Art Blakey tour in Europe and I tell them, “I wasn’t there.” And they just point to it. I sign it anyway. But I didn’t go to Europe with Art. The first tour with Nat, I think, was Australia. So, you have to make decisions in life. Was there necessarily a best choice? I don’t know. I enjoyed my time with Nat and it was very important for me. I’m sure if I had stayed with Art, it would have also been important. But these are life decisions that you have to make. I couldn’t make a wrong decision with that one. TNYCJR: What a choice to have to make: Art Blakey or Nat Adderley. VH: Right. I’ve had the good fortune to work with a lot of great musicians. TNYCJR: You also played with singer Nancy Wilson. VH: Yes, I did some tours with her and some isolated gigs like the Hollywood Bowl and Avery Fisher Hall. TNYCJR: Nancy is quite versatile, having recorded everything from straightahead jazz, traditional pop and standards to soul and funk. Working with her, did you have to approach a variety of styles? VH: No, because every time I worked with her, it was doing the Nancy Wilson/Cannonball Adderley music. That’s what it was every time I played with Nancy Wilson. TNYCJR: Which was appropriate given the influence Cannonball had on your playing. TNYCJR: You have been teaching at William Paterson University and the Manhattan School of Music. In what ways do the young music students of 2017 differ from when you were their age back in the ‘80s? VH: Students today, overall, are much more prepared, much more aware, much more in tune than me and my peers were at the same age. There are some things that are better and some things that are not as good. One of the things that is better is that they are able to experience and hear great players via video, YouTube and things like that online. It’s not as good as getting to hear these people live; through no fault of their own, they didn’t get to hear them live. But in terms of having mechanical information about the music, they’re much more in tune and often come in very well-informed and more technically proficient than me and my peers were. TNYCJR: That’s saying a lot because the ‘80s is the era that gave us Wynton and Branford Marsalis, Terence Blanchard, Donald Harrison and many others— The Young Lions. VH: I’m telling you: the percentage of people that are prepared is higher now. I’ll put it to you like this. Are you into sports? People want to talk about how great the NBA was in the ‘60s, ‘70s and ‘80s. But guys now, their skill set is so superior. Their physical training and nutrition is so superior. Any of these peak athletes would have been a freak of nature back in the day. A lot of old-timers would tell you that it was much better back then, but these young guys today are faster, stronger, more skilled. It’s like this in music also. TNYCJR: The question for young musicians is, “What opportunities are there going to be for them in the future?” VH: There’s things that we can’t see. For instance, the ‘70s—going from what people have told me—was a down period for jazz. It seemed like things were dying out. No one saw Wynton coming along. TNYCJR: In the ‘70s, people were saying that straightahead jazz was music of the past. VH: And all of a sudden, the whole Wynton phenomenon happened and the next thing you know, there was a resurgence of the whole jazz scene. TNYCJR: You’ve been living in New York City since the early ‘80s. In what respects has New York’s club scene for jazz evolved since then? VH: To be honest, I don’t really notice that big of a difference in the jazz clubs. One extreme difference is that at that time, the space where Smoke is now was a watering hole. Now, it’s a professionally-run jazz club. But that’s one isolated place. As a business model, it hasn’t really changed much with the jazz clubs. For more information, visit vincentherring.com. Herring is at Birdland Aug. 29th-Sep. 2nd as part of a Charlie Parker birthday celebration and Smoke Mondays. See Calendar and Regular Engagements.